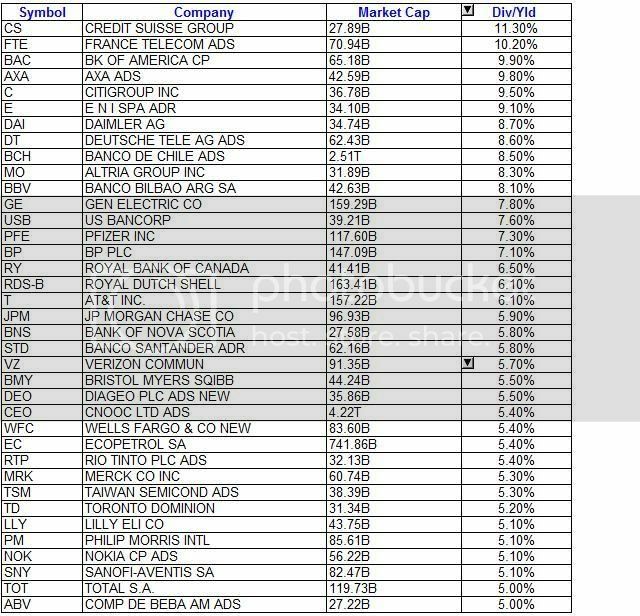 In an effort to highlight the dearth of available blue chip organizations with high market capitalization providing investors with a high yield as a result of the recent market downturn, I’ve captured the stocks with Market Capitalization of over $25 Billion that yield at least 5%. This data is current as of 1/11/09. The following table is sorted by highest yield first. 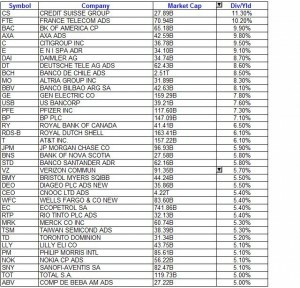 Note that of these 37 stocks, it is likely that some of them will have to curtail or halt their dividend payments in order to either preserve cash or to maintain their credit rating. For instance, Bank of America’s dividend has been cut and may be cut again according to some analysts. Additionally, given 1/3 chance that GE will lose its AAA credit rating, it may find itself in a position within the next year where the company needs to choose between sustaining its dividend at its current rate and losing its competitive advantage of the low cost of capital or it may have to cut its dividend and draw the ire of investors assuaged by prior commitments to maintain the payout. In summary, while this list is a good place to start, it is recommended that you perform some additional analysis on whether projected earnings can cover a sustained dividend and other factors. How about a readable version of that table? Yes, one of the drawbacks of the theme I chose for the blog. When I insert a full-sized image, it messes up the columns on the right. I can read the info with my resolution, but agreed, not ideal. If you have trouble reading it, feel free to submit a comment through my contact page and I’ll email the table until I figure out a better way to present larger images here. didn’t B. of A reduce the dividend to 1 cent? I like Altria and PFE – they should be in a strong position. Yes, subsequent to this posting, on Jan 16, BAC cut the divvy to 1 cent. Somewhat predictable, priced in to the stock I believe. I think Altria is real strong; may buy some myself. A bit worried about PFE and how they’re going to replace those Lipitor revenues. Buying a biotech or two may bring in a billion here a billion there, but the days of the 10 Billion+ blockbuster are over. It’s time for a new business model and I don’t know that PFE can adapt (or maintain that dividend indefinitely). Next few years, they may be OK though; I guess it depends on how long you hang on and when a cut gets priced in. forty2, the rookie here figured out an interim solution for a larger view; click to enlarge and it redirects. I’ll get better at this, I promise! You’ve got a very interesting list here. In particular, I see some international names there (CS, RY, RTP), and I think that’s key long term. I know the dollar is strong now, but how long can that last? I just clicked on the image and I can see everything… No troubles here. I should highlight; I do own GE, had posted previously at Everyday Finance. Leadership again committed to maintaining the dividend. The tape is ugly, but as long as this dividend remains, I’m making 8% + dividend income for perpetuity. I do advise against pure financials; even if they haven’t taken the TARP funds yet (as GE chose to take funds from Buffett at 10% instead of TARP funds at 8% due to the shame), many of them will be forced to eventually. the tiny chart gets big if you just double click it with mouse. It works that easily for me, so I assume that’s a window mouse feature.